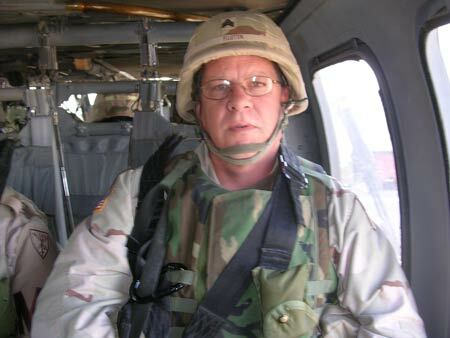 Virgil Huston on a Blackhawk helicopter going to Baghdad in March, 2005. Virgil Huston of Trenton has had three of his poems published in this month’s edition of Blue Streak: A Journal of Military Poetry, a publication of Military Experience and the Arts (MEA), a non-profit, volunteer run organization whose primary mission, according to their Web site, is to work with veterans and their families to publish creative prose, poetry, and artwork. In an Oct. 2013 interview with Kathryn Broyles of MEA, Huston relayed that while he is not new to the art of writing, having extensively produced non-fiction and technical works as well as curriculum development, poetry is a new art outlet for him. Having missed being drafted into the Vietnam War, Huston was on active duty during the Cold War and served with the Army National Guard in Iraq. The realities of war that he saw during these years have given him plenty of themes for his poetry, and his poetry has given him an outlet for dealing with these dark issues. Huston now uses his poetry as a form of therapy and encourages other veterans to look to the arts to do the same. Along with his recent publications, this creative veteran also writes a food blog, Cooking with Little Buddy, where he features tastes from the over 28 countries and cultures he has seen during his time in the service. The following is an excerpt of “Valhalla”, one of the three poems by Huston to be featured in this month’s Blue Streak. To get a copy of Blue Streak or to find more information on MEA, visit their website at www.militaryexperienceandthearts.org. by those we try to rule. the politicians send them to? While the politicians stay at home. by Odin in the Valhalla halls? the Crusades are long forgotten. or the great rewards there are. If we only remembered and believed. So, why do we fight these wars? Brainwashed warriors have no place. And the warriors die for nothing.